'S e baile mòr eachdraidheil air àirde an ear-mheadhan na Frainge a th’ ann an Lyon (IPA: ljɔ̃, Arpentan: Liyon, Eadailtis: Lione). 'S ann às a’ Ghallais Lugodunum (Gàidhlig: Dùn Lugh) a tha an t-ainm. Tha e suidhichte aig 175m os cionn ìre na mara, ri taobh na h-aibhne (Fraingis: Rivière) Rhône, anns an roinn (Fraingis: Département) Rhône. Tha am baile 395km air falbh bho Pharis (Prìomh-bhaile na dùthcha), 294km bho Bhordeaux, 276km bho Mharseille agus 559km bho Lille. Tha 474,946 duine a’ fuireach anns a’ bhaile. Chaidh am baile a chlàradh airson a’ chiad turas ann an 43 Ro Chrìosd le Lucius Munatius Plancus. 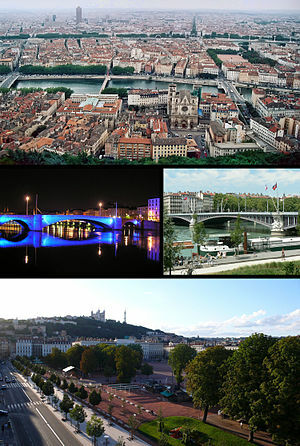 'S e an treas baile as motha sna dùthaich a th’ ann an Lyon. Chaochail an Ceimigear Victor Grignard an seo ann an 1935. Tiberius Claudius Caesar Augustus Germanicus (10 – 54): Ìmpire Ròmanach. Caralla (188 – 217): Ìmpire Ròmanach. Antoine de Saint-Exupéry (1900 – 1944): Sgrìobhadair agus paidhleat. Jean Michel Jarre (1948): Ceòladair. ↑ “Coopération Lyon Beer-Sheva (Israël), Relations Internationales” (Fraingis). La Métropole de Lyon. Air a thogail 12mh dhen Dùbhlachd 2016. Air a tharraing à "https://gd.wikipedia.org/w/index.php?title=Lyon&oldid=524739"
Chaidh an duilleag seo a dheasachadh 12 dhen Dùbhlachd 2016 aig 21:23 turas mu dheireadh.